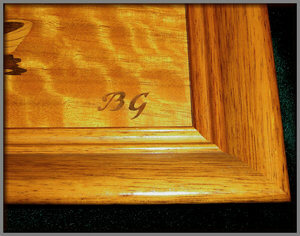 Here we have an example of a possible special commission from the Buschmid & Gretaux wood inlay company. The picture you see on this page displays one of their very attractive views of Heidelberg. 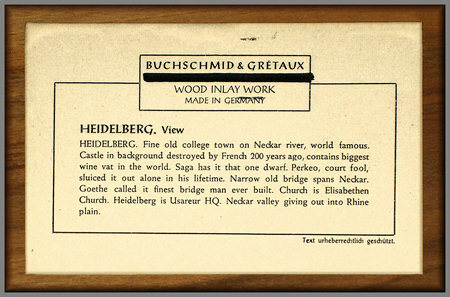 Buschmid & Gretaux do actually list the title of Heidelberg in their standard lists, but their normal version of this picture is around ten inches smaller than this example. If you can help us with any further information on similar large pictures produced by the Buschmid & Gretaux company, would you be so kind as to contact us by clicking the link to the right of the article below. Thanks for your help. We received, (a short while ago) an enquiry from Kent & Linda Johnson regarding a Buschmid & Gretaux picture they have owned for approximately the last twenty years. 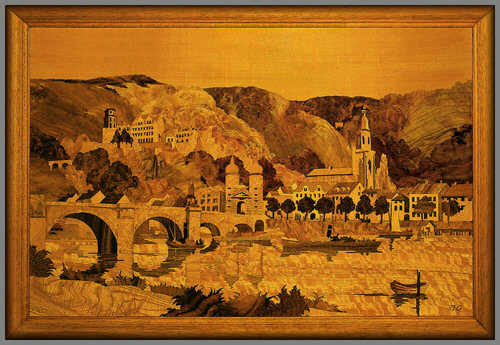 This particular picture, even though its title exists in the regular Buschmid & Gretaux lists, is somewhat larger than the standard works produced by the Buschmid & Gretaux wood inlay company. Heidelberg (the title of this Buschmid & Gretaux picture) is certainly listed in group 1 of the Buschmid & Gretaux catalogue. This "larger than usual" Buschmid & Gretaux work makes us think that it may well have been a special commission. We appreciate that the Buschmid & Gretaux company did probably, on occasions, make such special pieces. But as this is the first verifiable example of a (possibly) specially commissioned piece, we have no other example from which to make any other judgments by. The usual Buschmid & Gretaux logo can be seen located at the bottom right hand corner of the picture - and the Buschmid & Gretaux label on the reverse of the picture helps with confirming the pictures authenticity. We would love to hear from anyone else who has such an example of an unusual Buschmid & Gretaux picture. New Information: Regarding the information we have listed above concerning the larger versions of the Heidelberg scene, please check out the "Additional Information" box on the right. It will bring you up to date with current knowledge appertaining to the numbers of individual copies of the larger 'Last Supper' B&G pictures there are in existence. If you think you may have one, would you get in touch with us by clicking the "Marquetry Enquiry Reply" box to the right of this page, or, if you are not using Outlook Express, then copying and pasting the address from the middle box below into your usual address line. Rather than our previous assumption that the above picture is a 'one-off' it has been brought to our attention that there is more than one similar sized copy of this superb work. The other is owned by Sid & Ricky Moore, and therefore it brings to the thought that these two pictures are from a small dedicated batch of less than ten examples of this work. Buchschmid & Gretaux did sometimes make small batches of certain titles (as we said, less than 10 pieces) so we must conclude this example is indeed one of those. Michael Sheppard has informed us that he also owns one of the larger Heidelberg pictures. This makes us think that B & G did indeed produce a small run of 10 pieces of this particular picture. B & G produced most of their work in batches of 10 - so that must be the case here. We are always pleased to receive additional information on all matters B & G.
Click the above button to return to page 6 of "Can You Help"
Click the above button to visit page 8 of "Can You Help"